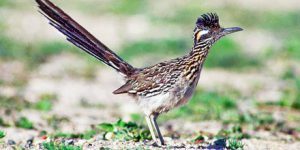 May 1, 2018 — Even though it can fly short distances when necessary, the roadrunner is a bird born to run. It sprints across the hills and pastures of East Texas at speeds approaching 20 miles per hour! "I stayed at Roadrunner Acres RV Ranch for a couple of months while I was temporarily working in Lindale. It was both peaceful and beautiful, and I always felt safe because of the perimeter fencing, security gate, security cameras, and watchful neighbors. I will stay here again if I'm ever in the area."